I've been a passionate musician all my life, and I love to make, repair and improve instruments. Especially WIND instruments! I recently discovered the beauty of the clarinet. There is a niche market for clarinets in the key of C (rather than the normal Bb). They allow the musician to read and think in standard concert key, like most instruments. I found a unique way to offer these instruments for sale. These C clarinets are from China, reborn in my New Mexico workshop. I was happy playing the renowned Ridenour C clarinet. But I bought one of these out of curiosity, and I was amazed ... it's a BETTER instrument! HOWEVER, numerous defects and mis-tunings beg for attention. I spend about 6 hours refining each instrument to a professional standard of performance. For half the price of the Ridenour C, you get a horn that is more in tune, with better keywork, and a better fit to large hands. The tone is exquisite! PRICE: $600 Warranty is 1 year / trial period 14 days. Specify if player has Small or XL hands. Use your favorite Bb mouthpiece, and enjoy the musical liberation of playing a C instrument! 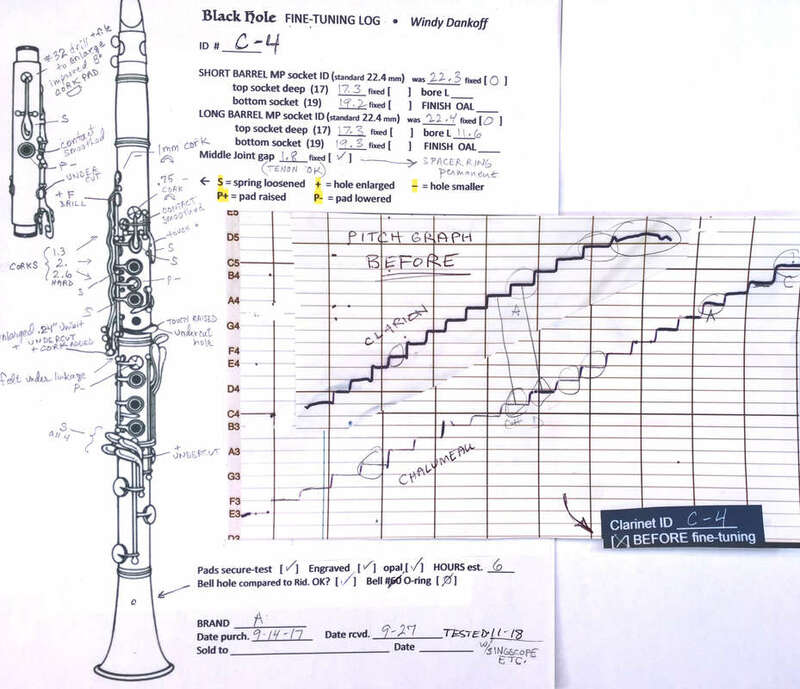 The image below shows a typical work log that I keep on each instrument. A pitch graph shows the original mis-tunings. As I correct them, I also smooth out the response of each note, and the feel of the keys. C clarinets come in REALLY handy for playing in church, playing flute parts in a pit orchestra, playing in a klezmer group or polka band. Now you can get a great playing one for a reasonable price! … Bottom line: Look what a wonderful instrument you can get for a bargain price! –– Phil Pedler, Clarinetpages.net: Reviews, Chinese hard rubber clarinets. ​Thanks Phil, for reviewing before and after my Fine-Tuning. “Your results with the clarinet are very solid. … I (with my Vandoren B48 dot 88 mouthpiece and Vandoren 2.5 reed) stay squarely in tune through most of the horn …. so I look to use your C when Beethoven (or Dvorak or Prokofiev or the others) and I next meet. Thank you very much for your work! I readily recommend it to others reading this note.